Named one of the 25 top eco lodges by National Geographic Traveler, Cristalino Jungle Lodge lies along the superbly biologically diverse Southern rim of the Amazon basin in Matto Grosso where 570 birds have been identified and new species are being identified each year. To help experience this extraordinary eco-sanctuary, Cristalino offers guides to take you on birdwatching, photography, general nature, and canoeing tours. In addition to 25 kilometers of pristine hiking trails, this eco-lodge stands out for its two 50 meter observation towers that allow eco-tourists a bird's eye view of the rainforest with every level from ground to canopy sprawled in front of their eyes. This Brazilian lodge's amenities include hammocks, refreshing baths, a floating deck with an open log fire, and a bar and outdoor restaurant where guests enjoy meals and drinks under the stars. Committed to responsible green tourism, The Cristalino Lodge grounds all of its ecotourism experiences in education and conservation. The eco-lodge's reserve is a refuge for endangered species and imposes strict regulations on its land holdings while fostering scientific and educational exploration. One of only five hotels in Chile to receive accreditation by the prestigious virtuoso hotel network, Remota Hotel is an architecturally stunning eco-hotel that serves as the ideal gateway to the Torres-del-Paine National Park. A UNESCO-World Heritage site, Torres del Paine is home to some of the continent's most dramatic scenery as the wedging of the Andes Mountains and the Patagonian Steppe makes way for crags, glaciers, waterfalls, rivers, lakes and lagoons. The eco-friendly hotel offers a portfolio of over 30 excursions daily that allows guests the opportunity to tour via 4X4 vehicles, horseback, or sail. In a region where environmental pressures force hotels to be innovative in conserving energy, Remota Hotel in Puerto Natales is a leader among green hotels. Built with locally-sourced materials and local workers, the sustainable green design includes natural grass turf on the roof. Additionally, this green hotel has employed energy-efficient lighting, low-consumption water systems and greatly utilized natural heat. Each of the hotel's 72 spacious rooms is naturally lit with spectacular views of the fjords outside. A UNESCO World Heritage site, the Pantanal is where the flora and fauna of the Amazon Forest, the Brazilian Savanah and the Paraguayan lowlands all converge and, as such, it is considered one of the world's great ecological mixing bowls. Amidst this extraordinary wetland sanctuary, the Araras Eco Lodge offers guests the opportunity to do world-class bird-watching, trekking in pristine forest, canoeing, horseback riding, and truck photo-safaris with their top-notch bilingual staff. The rustic 19-room lodge allows guests to escape the heat in air conditioned rooms with screened windows. The hotel also features a swimming pool, a large veranda with hammocks, reading room, and a restaurant serving organic and locally-sourced food. In addition to preaching and practicing eco-friendly tourism, the Araras Lodge has undertaken several projects including the regrowth of the bee population and the treatment of garbage and effluents. 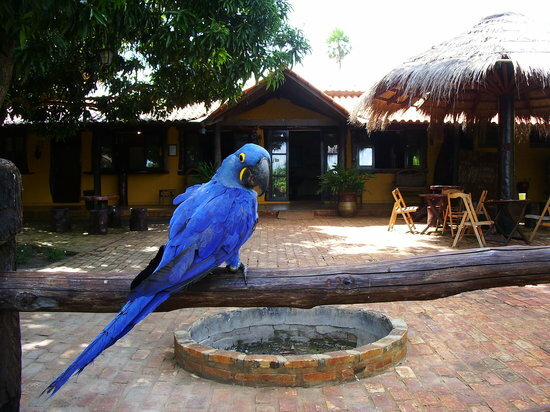 Araras Lodge proudly boasts that they have nearly tripled the population of the endangered hyacinth macaw living in its borders through meticulous nest monitoring and redistribution. Eco-camp Patagonia in Chile's Torres del Paine National Park allows eco-tourists to be fully immersed in nature with geodesic domes that could be considered the most comfortable tents in the world. Each dome comes with comfortable beds, low-emission wood stoves, a propane heater, and comfortable king-sized beds along with a state-of-the-art compost toilet. 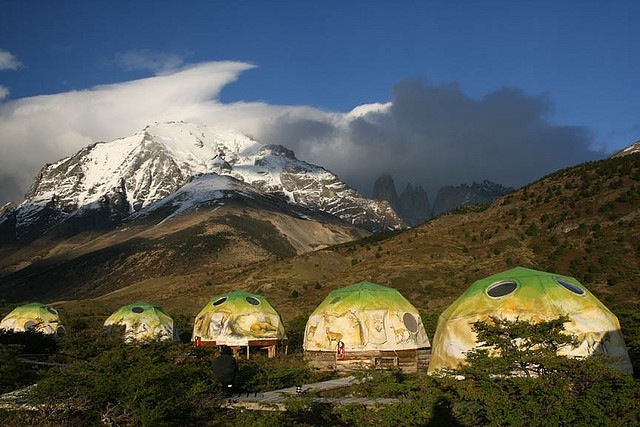 The domes are eco-friendly but also sturdy and guaranteed to protect you from the harsh Patagonian windscape. Additionally, the eco-camp has community domes, a yoga dome, and a dining dome where the top-flight culinary staff prepares a locally-sourced cuisine that fuses Chilean, Patagonian and international cuisines. Guests can enjoy a trek across the majestic plains of Torres del Plaine National Park as well as wildlife safaris, fjord sailing, and kayaking. The travel company can also arrange a larger trip to the Perito Moreno Glacier across the border in the Argentinian Patagonia. Earning recognition from both Conde Nast and Smithsonian magazines, the Mamiraua Ecological Reserve and Uacari is one of the most widely-known eco-tourism lodges in South America and for good reason. At the Uacari Lodge, guests don't just experience the Amazon Rivers but they literally live on top of it. The Uacari Lodge consists of 10 floating houses on a bend in the river connected by floating walkways. Decked with modest eco-luxury trappings, the hotel's amenities include a central structure with a games/tv room, restaurant, and meeting room in addition to a small netted pool (to protect from piranhas and alligators) and a hut for wildlife watching. Ecotourists can enjoy a substantive library of books and videos as well as a local guide to show you the reserve rich with over 400 identified species of Amazonian wildlife. The one-of-a-kind floating suites were built with local materials by the community and have adapted to green living with solar energy, rainwater recycling, as well as a specially-designed sewage system. The Mamiraua was one of the early leaders in ecological development in this area and the proceeds from Uacari Lodge go to the local peoples and natural resource conservation. Named one of the top 10 EcoLodges in the world by Outside Magazine, Black Sheep Inn provides a truly memorable vacation to eco-tourists seeking adventure off the beaten path. The remote but geologically spectacular Ecuadorian mountain state of Cotopaxi is home to three spectacular national parks, allowing visitors to see cloud forests, crater lakes, canyons, and the renowned Cotopaxi volcano. Cotopaxi volcano, which has erupted more than 50 times, is considered by many to be the world's highest active volcano. Black Sheep inn also offers horseback riding and mountain excursions in addition to a zipline, waterslide, treehouse, sauna, yoga studio and delicious vegetarian cooking. The proprietors of Black Sheep Inn know that becoming ecologically self-sufficient in food, water and energy production will never be a finished project which is why improving efficiency is part of their everyday process. The hotel uses composting toilets, a hybrid solar/wind system that doubles as water pump and a comprehensive recycling program. The hotel is also a big proponent of permaculture. Whether snorkeling in crystal-clear waters, horseback riding or touring a privately-owed natural reserve, Recanto Ecologico Rio da Plata is one of Brazil's most respected eco-tourism operations. It has twice been voted Brazil's best tourist attraction by readers of Brazil's most respected travel guide and was awarded a Sustainability in Tourism Award by the Brazilian Tour Operator Association in 2013. Tours take you to Lagao Misteriosa where sinkholes lead you to an underwater cavern to which the bottom has still not been discovered. The eco-hotel has adopted eco-friendly practices such as solid waste recycling, anorganic kitchen garden and tree nursery, and careful surveying of visitor impact management and ecosystem monitoring. Located on the banks of a protected ox-bow lake, Sandoval Lake Lodge is the ideal destination for eco-tourists looking to be immersed in the natural beauty of the picturesque Lago Sandoval. The Sandoval Lake Lodge specializes in hospitality and is best equipped to handle small groups and individuals. The eco-lodge features evening slide shows at night, and forest and lake excursions during the day where giant otters, monkeys, macaws and other local wildlife can be spotted. The Sandoval Lake Lodge is constructed from ecologically-correct driftwood mahogany and is jointly owned by a non-profit conservation groups in conjunction with five indigenous families. 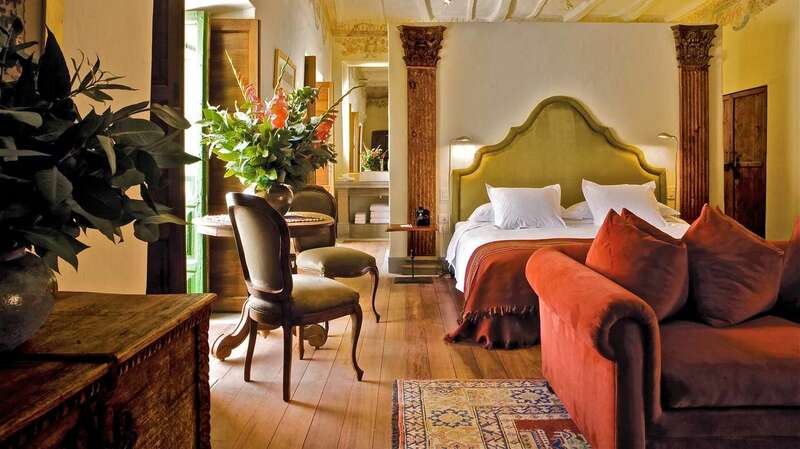 One of the highest-rated hotels in Cuzco, Inkaterra La Casona is a luxury boutique hotel that’s been created out of a meticulously restored 16th Century Colonial Spanish Manor. Eleven luxury suites lie adjacent to an open courtyard and the style of a regal hacienda. The hotel is also centrally located near the town’s historic center known as the Plaza de Armas and offers free breakfast, a full-service restaurant and complimentary wi-fi service. Over 3 million tons of carbon are reduced through the Inkaterra’s personal protection of 17,000 hectares of original forest. The hotel chain has also created the Inkaterra Asociacion, a non-profit dedicated to Ecological sustainability, cultural preservation and natural resource conservation through active field work, biodiversity monitoring, fostering of the scientific and anthropological communities, and educational programs. 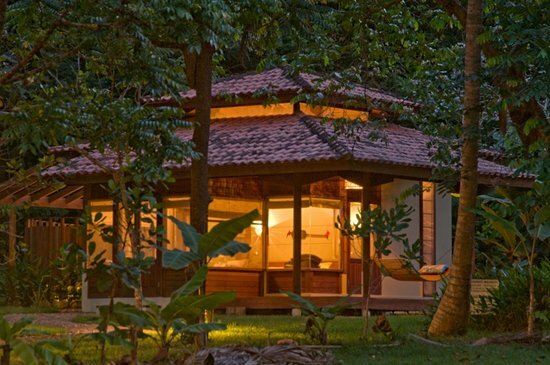 The rustic fishing village containing one of Brazil’s most beautiful beaches is home to this rustic lodge. Located next to Jericoacoara’s iconic Sunset Dune, the main lodging facility has stilt houses three meters above the ground suspended by eucalyptus columns. The hotel’s amenities also include a garden with a reading deck and a swimming pool with a duneside view. The villa’s construction from moracatiara wood, carnuba straw and mud bricks was carefully developed with the full consultation of the local population to be eco-friendly and connected to nature. Additionally, this eco-friendly hotel has also funded a documentary on the local Jeri people whose environment and way of life are being threatened.